Hello. Your articles are always so helpful. Thanks. I am looking for a way to set an individual post (or possibly posts in a designated category) to republish regularly (such as weekly, on Sundays, every 10 days or similar). This would operate independently of any other global republishing schemes. Nothing is coming up on google. I posted a product and when I updated that product it automatically scheduled for me three days later. I do not know what’s going on. If you help me! Hi, It is a great and simple schedule tip you have share here. But I have a doubt. 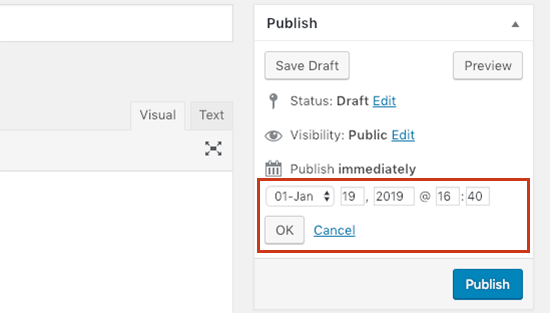 WIll it affect my blog, if I scheduled more than 5 posts to be published a day? Will it affect my blog’s SEO performance? I scheduled a post and it has posted three times on my home page. I only wanted it to post once but now I have now clue what I did to make it post three times:( Any help? You can delete the duplicate posts. If this happens again, then please review your plugins or contact your hosting provider for help. It is working fine at our end. Please try these WordPress troubleshooting steps to figure out what’s causing this issue. I’m totally unable to schedule posts. I can’t even click the button! Nothing happens. Some help would be great… I’m going on holiday soon and need to do some scheduling. Many thanks. I can’t see the calendar button anymore. Why is that? It was there a few days ago, yesterday it disappeared and now can’t find it anymore. I can only publish on the spot, but no way to schedule it anymore. Me too. Maybe it’s gone??? Surely they wouldn’t make it not an option any more?! Is this 24hrs time format? I have a page that i update daily, is there any way i can schedule say a weeks worth of updates for the one page? Rather than having to update it daily…..
You could check out h Revisionary plugin if you haven’t already. It might get you closer to what you are looking for. 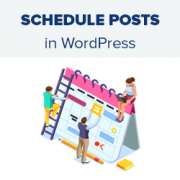 I want to everyone can see Schedule posts at my site..
You can try ‘SOUP – Show off Upcoming Posts’ plugin. 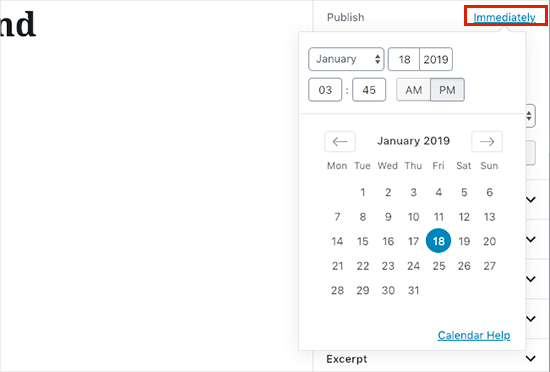 Question, My scheduled posts are working just fine, but on my blog on the home page where you have a list of the various blog posts and a “read more” option for each one, there is this random circle on all the scheduled blog posts. I dont really want everyone to know which ones were scheduled and which were posted live. Is there any way to remove this? Hello, I just scheduled my post but when the day and time arrive, Nothing is happening. Only publish today i see even if the time have passed. Hi, my scheduled posts are giving an error on both websites I am maintaining – how do I check for any errors? I already have too many plugins installed and don’t want to add another for this.. just wondering why the error is there and what I can do to fix it? I don’t see an option for scheduling at a.m. or p.m. In my settings, I’m using a 12-hour clock, not a 24-hour clock, but it looks like I have to use 24-hour time here. Or am I missing something? Thanks for the info on this. Everything seems to go ok at first. I make a change to a page that I don’t want to be visible for another couple days. I pick my date/time and hit schedule. The problem is that for the next couple days anytime I go to the page I get an oops page not found error. Once the scheduled time arrives, then the change goes through and everything works fine again. Please help this is driving me bonkers! The page will not appear until the time it is scheduled to be published. 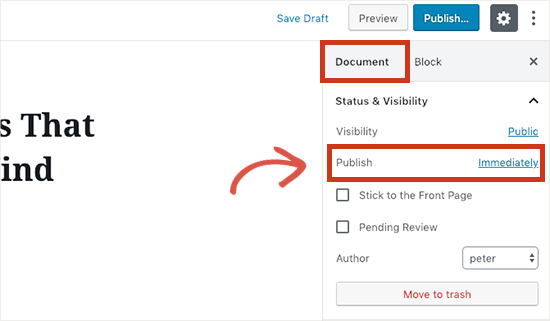 If you want to take a look at the page before it is published, then you need to login to your WordPress dashboard. Go to Posts or Pages and locate the post/page you scheduled. You will find a preview link below the post/page title. Wow! I never thought it would be such an easy fix. Thank you so much! Hi. On one of my blogs, scheduling isn’t working. After I hit edit and ok, the schedule button doesn’t appear. Any ideas why this might be happening on one site, but not the others? They’re all updated to the most recent WP version. Thank you! You add time in 24 hr format. Like 13:00 for 1 pm. Am I missing where you pick am/pm? I don’t understand how the time my visitors coming relates to the time I should post. If they come on Fridays at 4:30 p.m. (while they’re waiting for their work week to end), shouldn’t I post any time before Friday at 4:30 p.m.? I want to be sure the content is already there when they come. If I publish at 4:30 p.m. and someone comes a little early at 4:27 p.m., they’ll miss my post. Even if I publish as early as Thursday, or last month, the content will be there waiting for them when they come this Friday at 4:30 p.m. I use scheduling more to free up my own time. If I have a week of scheduled posts I don’t have to sit down every day, think of what to write, write the post and publish immediately. It lets you have a day off without your blog being neglected. Thank you! We travel extensively. This is perfect! We also want to have about 10 posts scheduled before we actually go public with our site so we’re not so pressured – we newbies at this! Thank you for this post. 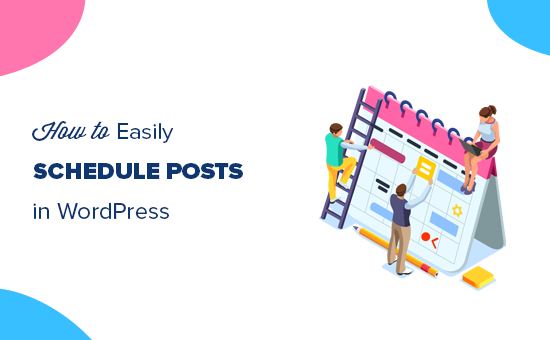 I thought I had to install a plugin to schedule posts, I had no idea that it was so simple! Even after getting adsense !! There is always a lot to learn !! Thanks for posting. Didn’t even know this feature existed. Good to learn something new everyday! 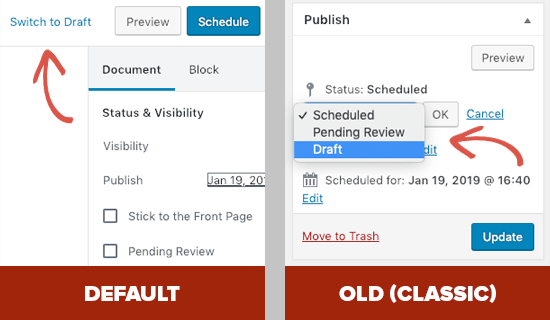 Please see our guide on how to fix missing schedule error in WordPress. Any suggestions on what to do about the “missing schedule” issue?